Topics of lifestyle and fashion make our lives more beautiful. They urge us to forget about the stress of our daily routines and immerse ourselves in the beautiful things in life. We at KunstLoft have made it our task to help you decorate your living room or holiday home with exclusive artworks. Extravagant motifs that grace our handmade acrylic paintings or 3D frame art will manifest your original style. Canvas paintings in soft pastel tones will bring the charms of Shabby Chic to your walls, whereas our artists can freely express their creativity in the composition of modern collage art. You can surely find what you want from our curated art selection! Eye-catching typography can speak for your person and your attitudes. Show your zeal for a modern future with cars and technology. Music brings rhythm into your life. Only a unique style of interior design can be match up to the unique person that you are. 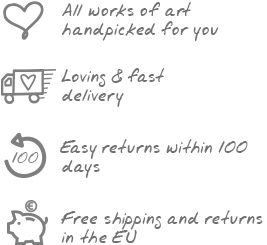 Purchasing one of our artworks means you have obtained a unique piece that is painted individually and differs from all other paintings. In every brushstroke you can feel the artist’s devotion to art and love for detail. To have a stylish taste in art does not necessarily mean that you need to hang an expensive replica of a famous classical painting in your bedroom or office. KunstLoft is your specialist for canvas paintings that shine in fresh and vibrant colours, bringing a smile on everyone’s face. For an ultra modern style you could present a handmade oil painting in copper shades that shimmers with a metallic lustre on your wall. Alternatively, our metal wall art made of copper can also create an intense sensation through the combination with cool colours. Do you have a passion for lifestyle and fashion? Then you've come to the right place here at KunstLoft! Motifs like shoes or cosmetics in acrylic paintings punctuate your inclination for the beautiful things in life. Decorate the bare walls in your bedroom or hotel with these stylishly designed trendy paintings.